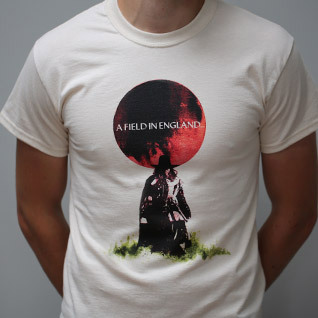 Cult clothing site Last Exit To Nowhere is offering an official A Field In England t-shirt for sale. Ben Wheatley‘s film saw its ensemble cast hunt for treasure in a field filled with mushrooms, and now you can emblazon your own (treasured) chest with the haunting image of the wicked O’Neill. As well as Michael Smiley on the front, four fifths of the rest of the cast – including own very own Richard Glover – are featured on the rear. You can pick up the extremely limited edition tee at the Last Exit To Nowhere site now, whilst stocks last.